The Blu-Ray media has seen a true revolution of older movies being converted to this technological impressive format that not only features improved picture quality but also crisp audio. The Dirty Harry series that stars Clint Eastwood was a true 70's phenomena as our rough and sometimes stereotyped actor played "Dirty" Harry Callaghan, a police officer who would go above and beyond to get the job done and having a Magnum .45 at your side generally pushed the odds towards you. 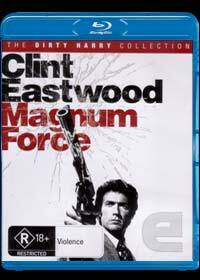 Magnum Force, although one of the longer Dirty Harry movies is easily one of the best in the series and story wise, Callaghan is investigating the unprovoked murders of criminals, only to discover that these hits are being organized by an underground vigilante group of police officers who have taken the law into their own hands. For Callaghan, this method of "justice" does not sit with his moralistic beliefs and in classic Eastwood style, he uncovers this heinous act with some great, albeit two-dimensional acting from our star. Video wise, the entire movie has been re-mastered and at certain points in the film, it seems like it was only filmed yesterday with exceptionally clear images, vibrant colours and good black levels. Needless to say, it's quite impressive how the video quality has been improved for a film that is over 35 years old. The Blu-Ray soundtrack also adds to the ambience of the movie that contains crystal clear sounds which sounds phenomenal through our surround sound setup. This is as close as to seeing the movie the first time at the cinemas and Warner Bros have successfully transformed and modernized this experience on Blu-Ray. For those wanting extras, Magnum Force has an interesting commentary by the screenwriter, John Milius who gives a true insight into the characters, filming and franchise. Match that with a documentary regarding the politics in Dirty Harry plus a variety of interviews with the stars plus some original trailers and this nicely rounds out this Blu-Ray disc. The best aspect of Magnum Force is that for a movie that is over 35 years old, it has dated quite well and can still be watched by fans of the original film and even a new audience who has yet to have experienced the "Dirty" Harry Callaghan.